These are from our first big "snow" a few weekends ago. I was having trouble with Blogger and wasn't able to get these pictures up until now. The "sled" Larry and Aidan are using is actually a storage bin lid. ;-) We've since bought a real sled for Aidan and they used it the other day when we got some more snow. Aidan loves sledding and he isn't scared to go down the hill by himself at all! 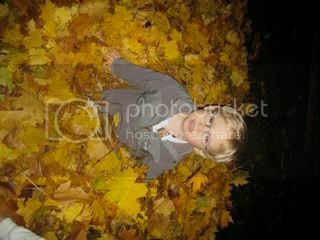 Just a few shots of Aidan playing in the leaves on Thanksgiving. We were over at a friend's house and they raked up a huge pile of leaves for Aidan and Sam to jump in. They loved it! !